Join our united front in supporting the Second Amendment, shooting sports and hunting heritage with an evening of food, firearms and fundraising at The NRA Foundation BBQ and Auction during the NRA Annual Meeting. Help us Teach Freedom by bidding on custom firearms, unique merchandise and specialized hunts. All proceeds benefit The NRA Foundation and the future of the shooting sports. 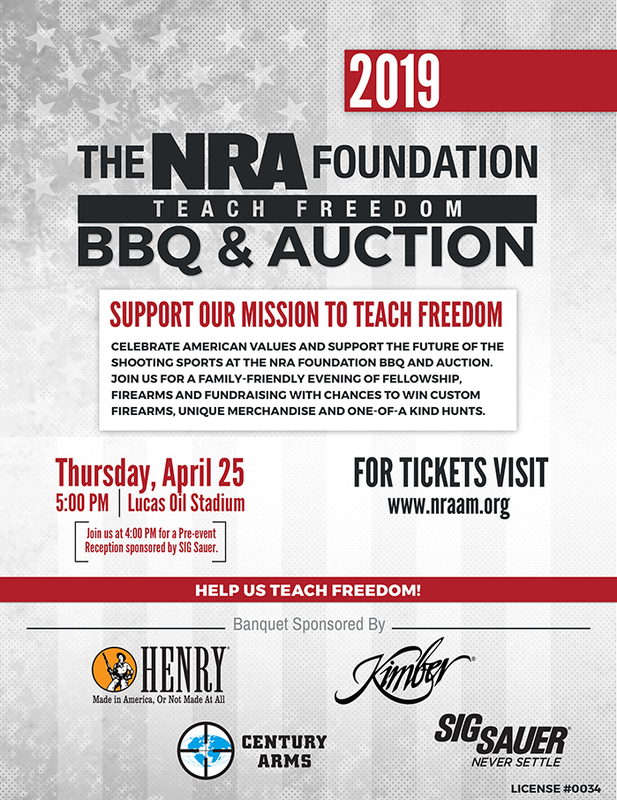 For questions about The NRA Foundation BBQ and Auction, email NRAFevents@nrahq.org. To purchase tickets visit www.nraam.org. Stop by and play the Wall of Guns at the NRA Annual Meeting from April 26-28, 2019. A $20 ticket gives you the chance to win a prize from the wall featuring over 40 firearms. All proceeds benefit The NRA Foundation and the future of shooting sports. Kick off the Great American Outdoor Show by visiting The NRA Foundation's popular Wall of Guns raffle - where a $10 ticket gives you the chance to win a prize from the wall featuring over 40 firearms. All proceeds benefit The NRA Foundation and the future of shooting sports. The NRA Foundation's Wall of Guns runs the entire length of the Great American Outdoor Show at the Pennsylvania Farm Show Complex in Harrisburg, Pa. Visit www.greatamericanoutdoorshow.org to learn more!